John Dickinson Society members pose with President Margee Ensign at Grand Central Terminal in NYC. Photo by Carl Socolow '77. Adventurous members of Dickinson College's John Dickinson Society (JDS) put on their sleuthing caps April 12 and explored little-known tunnels deep underneath Manhattan, searching for the treasures that awaited. 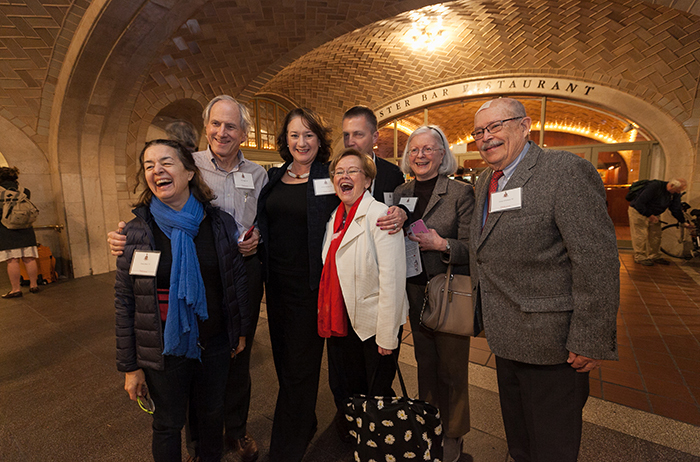 The JDS scavenger hunt brought approximately 50 NYC-area alumni and parents together on their home turf—or, rather, beneath it—to enjoy one of the city’s most-visited tourist sites in a way that residents typically never do. They gathered at Grand Central Terminal, a U.S. National Historic Landmark and architectural marvel constructed in 1913 at the intersection of 42nd Street and Park Avenue. All NYC-area members of JDS, Dickinson’s leadership donor society, were invited to attend, along with three upper-level students as well as Dickinson leadership and staff. Then it was time to divide into seven Dickinson-themed groups—such as Team Mermaid and Team Red Devils—and for each group to find its starting point in the terminal. And they were off! Each team had one hour to use an app to find points of interest in the terminal, like the iconic four-sided clock, dazzling painted ceiling, “whispering gallery” and hidden passageways. When the hour was up, participants gathered in the glamorous Campbell Bar to tally up their points. "It was a great way to build relationships with other like-minded alumni," said La'Dell Peton ’09, "and I think I’ve made some really good lifelong connections as a result." View a gallery of photos from the event on Facebook.